Chemotherapy-induced anemia is a frequent complication of systemic chemotherapy and is associated with decreased functional capacity and quality of life. The objective of this study was to identify the candidate variables most likely to be associated with chemotherapy-induced severe anemia (hemoglobin < 8 g/dL) in patients treated with cytotoxic chemotherapy. 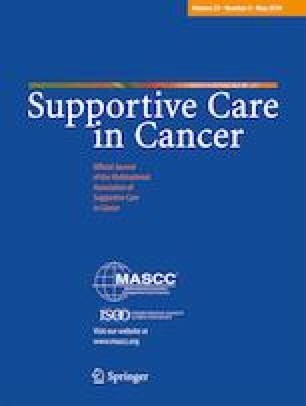 A total of 14 clinical and laboratory covariates were prospectively evaluated at baseline in a cohort of consecutive cancer patients receiving cytotoxic chemotherapy. The anemia risk category for each chemotherapy regimen used was determined based on pivotal trials published in the literature. All regimens were classified to three categories (high risk, intermediate risk, and low risk). Logistic regression analysis adjusted for the regimen risk was used to determine the candidate risk factors associated with chemotherapy-induced anemia. A total of 305 patients were included in the study. Administration of high-risk regimens (i.e., regimens with ≥ 20% risk of anemia in a pivotal trial) was demonstrated to be a novel independent predictive factor for severe anemia (odds ratio 3.33, p = 0.005). Considering regimen risk as an adjustment factor, 5 readily available predictors including low hemoglobin, body mass index (BMI) less than 23 kg/m2, low hematocrit, high haptoglobin, and high ferritin were associated with the outcome. The application of these candidate predictors would be helpful in classifying patients at risk for severe anemia, who might be appropriate candidates for prophylactic erythropoietin. Multivariable models including such promising candidate predictors need to be developed. The online version of this article ( https://doi.org/10.1007/s00520-019-04780-7) contains supplementary material, which is available to authorized users. This study is related to the project NO. 1397/69569 from Student Research Committee, Shahid Beheshti University of Medical Sciences, Tehran, Iran. We appreciate the “Student Research Committee” and “Research & Technology Chancellor” in Shahid Beheshti University of Medical Sciences for their financial support of this study. The authors would also like to acknowledge Behnam Daheshpour Charity Organization for supporting this work. This study was supported by the Student Research Committee in Shahid Beheshti University of Medical Sciences, and Behnam Daheshpour Charity Organization.